With so many food options to choose from, it can become difficult to determine which foods will offer you a healthy choice. The multiple nutritional claims that we must sift through makes it difficult to determine what we are actually purchasing and consuming. That is why we will make your choice of White Earth Wild Rice, well, easy. "Growing wild in our natural lakes and rivers, our wild rice is traditionally hand harvested and finished, and is naturally organic, just the way mother nature intended it to be." Yes that is it, easy right? 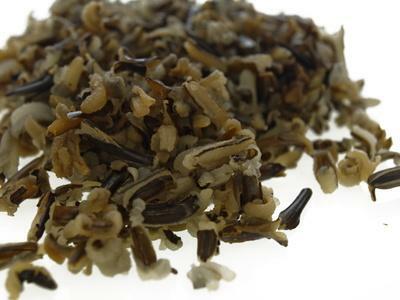 White Earth Wild Rice has an earthy nutty flavor that is high in protein, dietary fiber, amino acids and is low in fat. It is not to be mistaken with genetically altered cultivated or paddy wild rice that is now widely produced primarily in Minnesota and California with the use of pesticides, insecticides, and other chemicals. We take pride in the fact that that we have a naturally organic product that has remained the same for generations. As a cereal grain, wild rice boasts many virtues, making it especially popular for health-conscious cooks, according to Purdue University's NewCROP agriculture program. "The nutritional quality of wild rice appears to equal or surpass that of other cereals," the university notes in its wild rice fact sheet. It is comparatively high in protein and complex carbohydrates while containing little fat. When compared with other whole grains, such as wheat and brown rice, wild rice comes out ahead in the minerals potassium and phosphorus as well as the B vitamins niacin, riboflavin and thiamine. Like many grains, wild rice is low in calories, fat and sodium. Each 1-cup serving contains 166 calories, 3 g fat and 5 mg sodium. Wild rice contains a good balance or proteins, carbohydrates and fiber. A serving of wild rice provides 6.5 g protein and 35 g carbohydrates, while providing 3 g fiber. The protein content of wild rice comes largely from the beneficial amino acids lysine and methionine, making it one of the more nutritious of the cereal grains, according to the Purdue program. It also contains beneficial amounts of heart-healthy linolenic acid. Wild rice represents a good source of some vitamins and minerals. A 1-cup serving yields 134 mg phosphorus, 166 mg potassium and 52 mg magnesium. On the vitamin side, wild rice contributes B vitamins to the diet, including 2.1 mg niacin, B3, .14 mg riboflavin, B3 and .08 mg thiamin, B1. It additionally provides 43 mg folate, B9 and 16.7 mg choline, a B-complex vitamim. For Additional Articles On Health Benefits Click Here. View our USDA certificates here.